This train was running with 37682 & 20308, but times are very unpredictable, as is the route. The previous week I waited ages for it, but it was sent via Bromsgrove instead. This week I tried again, to cut a long story short, after a wait of a couple of hours I eventually saw it – but it was too dark for a good photo. This entry was posted in Sharpo's World Photo Updates on October 30, 2010 by Sharpo. Ended up at Bewdley all 3 days, seems like 4566, 7812 & 43106 were working the services each day, although I didn’t see the 3 locos every day. Today was a bit of a hard slog, getting to Bewdley by public transport (on my own, fortunately) as there were delays on London Midland trains. Trains at Old Hill are every 30 minutes, but more stop at Cradley, so that was where I headed. At Cradley it was apparent there were still problems, one train was over 30 minutes late, and eventually cancelled, and others were delayed, but I managed to get to Stourbridge for the “Dodger”. Then the bus to Bewdley was late, and delayed even further by roadworks near Kidderminster. The SVR train had already departed by the time the bus approached Kidderminster station, so I had to stay on to Bewdley, arriving there about 20 minutes late. At least there was time for lunch before catching 4566 back to Kidderminster, then bus, dodger, train & bus home. It’s so much easier by car!!! 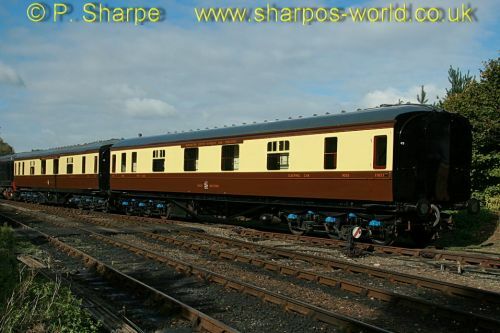 This entry was posted in Severn Valley Railway on October 30, 2010 by Sharpo. After a few hours at Northampton, we moved to Tamworth to see 71000 heading south & 47500 heading north. Unfortunately missed a few trains on the high level lines, but it makes a change to see the electrics, including an 86 in the new livery. Locos seen:- 47500, 60074, 66028, 66029, 66148, 66420, 66594, 71000, 86605, 86610, 86613, 86637 & 90016. This entry was posted in Sharpo's World Photo Updates on October 28, 2010 by Sharpo. Following on from an earlier posting, the photos from Northampton have now been uploaded. It’s great photographing in sun, until it is no longer on the side of the trains. Locos seen were:- 31602, 66028, 66029, 66107, 66534, 66541, 66593, 90044 & 90045, also DR73930. Half term & grandson wanted to go on the SVR, again! A dull & wet journey to Highley, only a few photos taken inside The Engine House, showing the latest exhibit – The Lady Armaghdale. This loco had been shunted in the previous week, 80079 & 7714 have also changed places to make room for the small loco. 4566 was hauling our train, crossing with 43106 at Bewdley. 7812 was on the 3rd train, seen passing The Engine House as we eat our lunch. This entry was posted in Sharpo's World Photo Updates on October 26, 2010 by Sharpo. Another sunny day, but it was cold down by the river. 46443 was on Footplate Experience, the service trains hauled by 4566, 5764, 7812, & 43106. Hopefully I’ll see some of the trains during the week, although I mustn’t forget there are still jobs to be done in the garden!!! 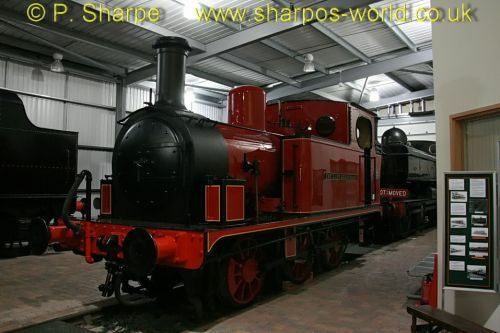 This entry was posted in Severn Valley Railway on October 24, 2010 by Sharpo. Not much of interest happening locally over the last few days, so a weekend is always something to look forward to – and of course the coming week which is half-term for schools and a daily service. Three trains were seen at Arley – 4566, 43106 & 46443. Not really – went to see 45305 on a test run to Stratford, but it was cancelled. This entry was posted in *Latest news by e-mail on October 20, 2010 by Sharpo. 9085 replaced 9084 today. D8188 also brought the Grotto coaches in readiness for Santa & his helpers in December. Other locos seen are 4566, 5164, 5764, 42968 & 43106. 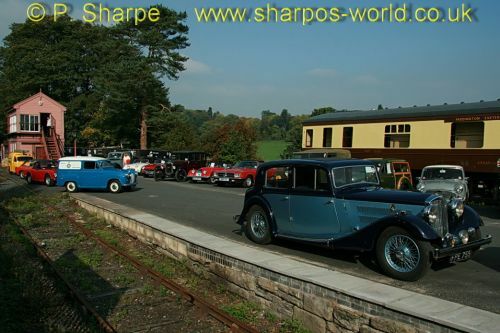 I was pleased to get both sleeping cars in one shot, and in sun! This entry was posted in Sharpo's World Photo Updates on October 16, 2010 by Sharpo. Following on from an earlier posting, most of the photos have now been added – just Highley and the morning shots from Kidderminster to be added , probably on Thursday. This entry was posted in Sharpo's World Photo Updates on October 13, 2010 by Sharpo. After attending the SVR Railcar Reunion, 121020 is seen at Smethwick as it heads for Aylesbury. Good to see it in the sun, as on both days it was running at the SVR the light was extremely poor. This entry was posted in Sharpo's World Photo Updates on October 11, 2010 by Sharpo.